The brilliant, complex espresso produced by large conical burr grinders is the holy grail for many coffee enthusiasts. Going into your favorite coffee shop and experiencing the unmistakable depth of body, flavor and mouth-feel just can’t be beaten. Bringing that experience home can be a challenge, but Eureka has made it more refined than ever before with the Olympus KRE Espresso Grinder. Right away you’ll notice that the KRE’s cast aluminum body shares the sweeping lines and clean design language of the beloved Zenith and Olympus. It also carries over the same interface we’ve loved for years. 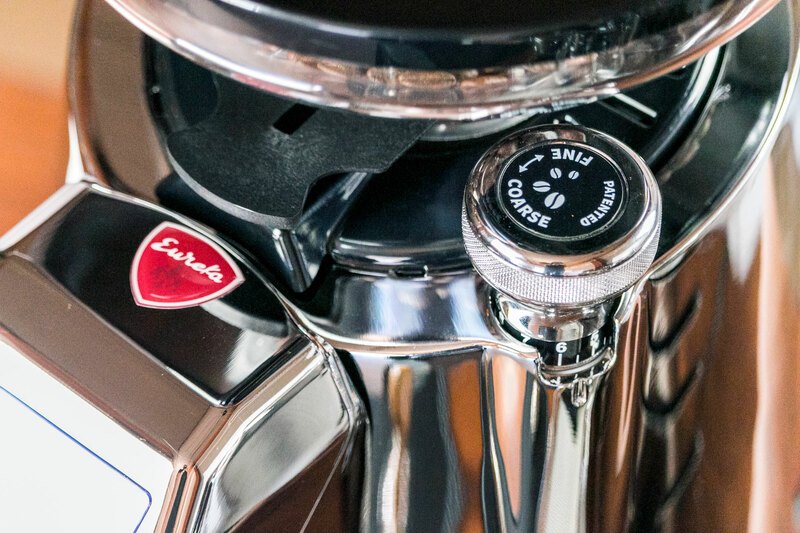 Two easily programmable grind times and a readily accessible adjustment knob with a satisfying mechanical fluidity make every dial-in feel premium. This patented design is ergonomic - making small or large changes quick and precise with just one hand. The design also allows you to remove the upper burr for cleaning without losing your grind setting, a particularly unique and convenient feature. It also sports an adjustable portafilter fork that can hold any portafilter hands-free, while the barista light illuminates the grounds. Its chute can also easily be adjusted to target your grinds at the center of your basket, simplifying consistent distribution and extractions. Within, you’ll find the beautifully machined 68mm conical hardened steel burrs and massive 840-watt motor. This is what you came for. Heat is the enemy of flavor when grinding coffee, so friction and speed are critical. This combination allows for the burrs to spin at a super low 330 RPM while producing a 20-gram dose in a blazing fast 3 seconds. The KRE also manages sustained, high-volume usage dutifully. In our testing, we pulled a dozen shots in a row and the consistency in shot time and output never waivered. Whether you put the KRE to work in your home espresso bar or at your newly established cafe, you’ll be delighted with the results. While the KRE is designed to excel with a full hopper, it’s capable of single dosing with the right routine. We found that the dose is typically within a gram of the input and that a variety of coffees can be used with minimal grind adjustment. Single dosing requires a longer grind time - generally around 18 seconds with the KRE - but the results were consistent day after day with minimal waste. At the end of the day, a grinder is only as good as the shots it produces. When it comes to flavor, the KRE stands toe to toe with its more expensive commercial rivals. Our shots had unparalleled clarity and consistency without any of the sour bite produced by lesser conical burr grinders. Fruit notes take on a jammy richness and chocolate undertones shine with pleasant acidity, more like a dark chocolate or premium cacao. We’ve enjoyed a multitude of coffees as straight shots, Americanos, lattes, and everything in between. The Eureka KRE is a truly commercial conical burr espresso grinder that offers innovative design alongside a smooth, simple user experience. But as I said, what really matters is that the shots it pulls are going to blow your mind.